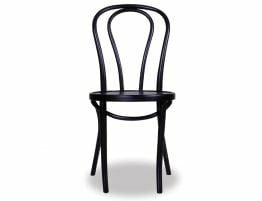 Oh how we admire the designs of master furniture maker Michael Thonet. His designs are well over a century old and yet still going strong. 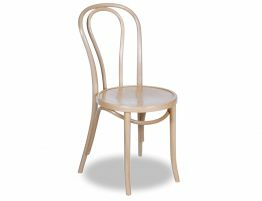 The Michael Thonet designed Vienna Café chair in beechwood is available in a range of fresh new colours that have artfully reinvented this classic chair. The iconic and trend worthy bentwood designs of Michael Thonet are staples in designer home kitchens and the tables of trendy bistros alike. These dining chairs offer the enduring style of a centuries old design that has withstood the flux of trends. 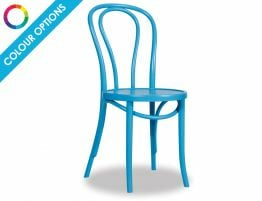 Our Michael Thonet designed originals are now offered in a range of bold and fun colours to add life and colour to your dining area be it your contemporary home kitchen or your commercial dining space. Our No 18 Vienna Café chair in red might just be the perfect update to your kitchen or dining room. Likewise, at our low, low prices, you can pick up as many of these European made dining chairs as you need. 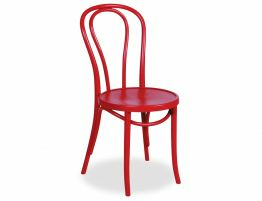 Here in barn red, these bentwood café chair offer a look that can bring to mind a rustic farmhouse kitchen or a chic, stylized French bistro—you decide. This barn red colour is remarkably versatile owing that it can look quite modern or quite traditional depending upon how it is paired. Put these wood chairs around a white round table and it can take on a retro feel. Pair this classic café chair with a wood slab dining table and it feels both modern and rustic. This café chair in barn red adds panache and style to any number of dining furniture styles. The Vienna Bentwood cafe chair offers the very best of current furniture trends in a design that is so enduring, you will appreciate these dining chairs long after the trend has passed. The classic Vienna café chair has been used, revered, reinvented time and time again. 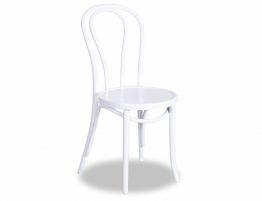 Bring this reinvented classic European designed and constructed chair into your space.